Car Detailing - What are Swirl marks and how are they caused ? What are Swirl marks and how are they caused ? Swirl marks or marring can be caused in a number of ways but the predominant cause has to be poor wash technique. 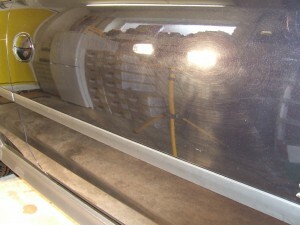 Surface marks on paintwork are the result of dirt and containments being dragged over the surface during washing rather than being removed with safe washing techniques or even by using old and dirty cleaning equipment. This dragging of dirt causes hundreds of micro scratches that then lead to light reflecting in uneven ways and making the paintwork look dull and lacklustre. The results of poor wash techniques are usually highlighted when you look at a car under street lighting or even on a sunny day you will see pronounced micro-scratching ruining an otherwise nice car. Despite the horrendous appearance of these marks the good news is that it is possible to remove them with the correct tools and techniques. It is possible to fill and mask the marks in with compounds that contain fillers but this is only lasts a short while and doesn’t resolve the issues. Wet sanding, using extremely fine abrasive paper and is usually necessary for removing egg shell (uneven paint finish) and deeper scratches. Machine polishing, this involves using a specialist polishing machine with various compounds and pads in combination to remove microns of damaged surface to refinish and return the paint surface to as new condition prior to application of waxes or sealants. These two methods permanently remove swirl marks and blemishes form the paint, they take time and expertise and should not be undertaken lightly as in the wrong hands you could end up with badly damaged paint surfaces or even end up facing an expensive trip to the body shop for a panels to be repainted !